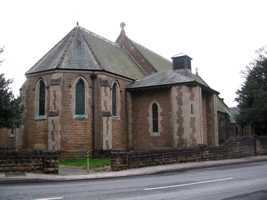 The stone church in Kirkby Woodhouse was erected in 1906. It replaced an earlier church of St John the Evangelist, built on a different site in 1860 as a chapel-of-ease in the parish of St Wilfrid’s, Kirkby-in-Ashfield. The new church was built in the early Gothic style, on land donated by the Duke of Portland. It consists of a nave with five bays, chancel and porch. There is an unfinished tower. The chancel and sanctuary have mosaic floors and there are carved oak choir stalls. It has no belfry as the sandy soil would not bear the weight. However, an enclosed wooden turret was erected on the top stage, and Taylors of Loughborough provided one bell for chiming in 1906. The stained glass windows at the east end are in memory of the fallen of this parish in World War I, and a wooden board records their names, 68 in all. The stained glass at the west end dates from 1949 and is in memory of three sisters. and to Linda Hanson and Judith Asquith for the photographs.